Drum Spill Control Sumps & Trays, Flexible Pop Up Pools for Spills, Spill Containment Bladder Basins for Cabinets at Global Industrial. Spill Containment Utility Trays help Control Chemical, Oil, Gasoline or other Liquids in Laboratories or Hazardous Material Handling Locations. Spill Containment Utility Trays are constructed of durable polyethylene for chemical compatibility, corrosion resistance and long lasting dependability. Trays are suitable as Drip Pans for storing lab chemicals on countertops and under dispensers. Trays nest for compact storage and feature a ribbed bottom for extra strength. 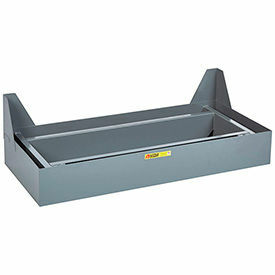 Available styles are Spill Trays, Utility Trays, Transformer Trays or Rack and Shelving Trays. Storage capacities range between 1.8 and 319 gallons. Dimensions vary per model. 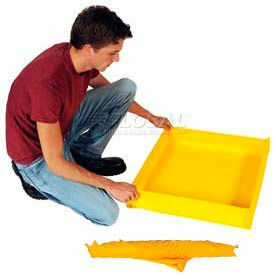 Flexible Utility Trays provide Efficient Control of Spills and Leaks of Hazardous Materials. Flexible Utility Trays are made of rust and corrosion resistant PVC coated fabric for long lasting durability and dependability. Ready for immediate use with no straps, supports or sidewalls to set up. 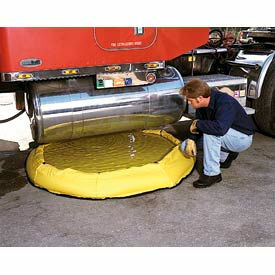 Flexible-sidewalls offer incidental spill control during temporary storage of drums, machine parts, tanks, and generators, and can also be used as a washdown pad or pumping station. Types are Tray with Grate and Tray without Grate. Capacities vary from 1-1/2 gallons to 89 gallons. Overall dimensions vary per type. Package quantity is 1. Pop Up Containment Pools provide Spill Containment for Applications including Waste Management, Hazmat, Fleet, and More. Pop Up Containment Pools are made of high quality materials for durability and corrosion resistance. Pools minimize spillage, maintenance, and environmental damage caused by fuel, antifreeze, acids, hazardous materials, and more. Units accommodate saddle tanks, cross-over lines, containers, machinery, and other equipment. Compact, folded design minimizes footprint for convenient handling and storage. Abrasion, puncture, UV ray, and cold temperature resistant. Gallon capacities range from 20 to 150. Dimensions vary per model. 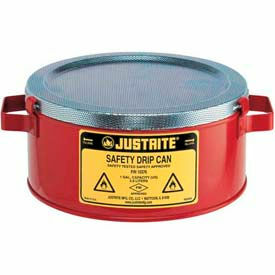 Justrite® Steel Spill Trays are used for Placement Below Drum Faucets or Cans where Drips and Spills can create a Fire Hazard. Justrite® Steel Spill Trays are made of 24 gauge coated galvanized steel with highly chemical-resistant powder paint finish for long lasting durability. 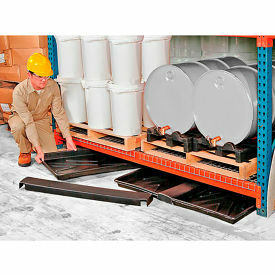 Steel Spill Tray offers low-profile, large diameter surface to contain spills and overfill from safety cans. Easily supports up to 5 gallon (19L) safety cans. Steel Drip Can catches up to 1 gallon (4L) of liquid. Top removes for quick cleaning. For use with flammable liquids. Perforated metal fire baffle acts as flame arrester to protect contents from fire exposure. Convenient side handles provide easy portability. FM approved. Types are Steel Drip Can and Steel Spill Tray. Capacities are 0.25 gallon and 1 gallon. Diameters are 9-3/8 in. and 13-3/4 in.. 1 Year Limited Warranty. UltraTech Ultra-Safety Cabinet Bladder Systems® are designed to Retrofit all Vertical Drum Storage Cabinets on the Market. UltraTech Ultra-Safety Cabinet Bladder Systems® are constructed of rust, corrosion and chemical resistant polyethylene and steel for long lasting durability. Heavy duty, inner steel framework keeps cabinet stable, even in fire. Significant leaks or spills unfurl the hidden containment bladder for complete spill containment. Small spills are captured inside the polyethylene sump. Available in 1 and 2 drum capacities; 82 and 100 gallon capacities. Meets SPCC, EPA Container Storage Regulation 40 CFR 264.175 and UFC Spill Containment Regulations. Little Giant® Spill Control Platform SSF-2045 - for 43"W x 18"D Safety Cabinets Protect Warehouse or Equipment Storage Area Floors from Caustic or Hazardous Chemicals. 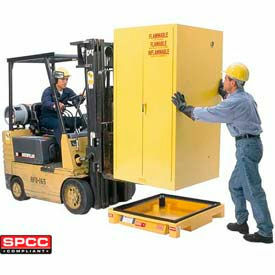 Little Giant® Spill Control Platform provide spill control for safety cabinets. Constructed from heavy-duty, all-welded,12 gauge steel for long lasting durability. Sump measures 20" deep x 45" wide x 6" high. Designed to accept most 18" D x 43" W safety cabinets, the platform will contain up to 25 gallons securely and keep leakages off the floor. Cabinets sit recessed in the platform by 1", allowing cabinet doors to fully open. The low profile design and steel braces in back ensure easy loading of empty cabinet. Durable gray powder coated finish.